Videodermoscopy improves the quality of diagnosis of skin tumours, and aids early diagnosis and the monitoring of patients at a high risk of melanoma. It allows 3D scanning to be carried out of all skin layers with very high resolution. This new skin imaging method is particularly suited to analysis of naevi, also known as beauty spots, and skin tumours. It therefore becomes possible to carry out “digital mapping” of the skin. With each consultation, an objective and detailed comparison of past and present skin maps is carried out such that any change is detected immediately and treated at an early stage. These regular check-up tests are essential for early detection of melanoma. 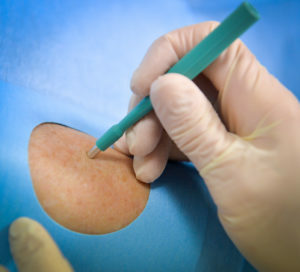 A skin biopsy is a very common diagnostic procedure carried out at the Institute. A skin fragment is removed under local anaesthetic then sent to a specialised pathology laboratory for analysis. The biopsy is carried out systematically in the case of skin tumours but also in the case of inflammatory diseases or whenever a problem with diagnosis is encountered. The procedure takes place at the Institute under local anaesthesia. Suture points are removed 8 to 15 days later depending on the site of surgery. A sample is sent to the anatomy-pathology laboratory to confirm the nature of the lesion and to verify that excision was complete. For malignant tumours, excision is often the only treatment allowing a full cure. Everything is done to ensure that excision is accompanied by the best aesthetic results. The same procedure is used for the excision of benign lesions such as cysts, naevi (beauty spots), sebaceous adenoma, etc. 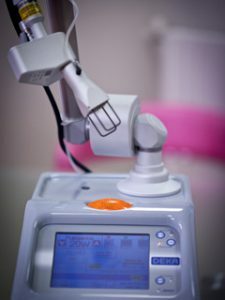 CO2 laser is an ablative surgical laser technique. 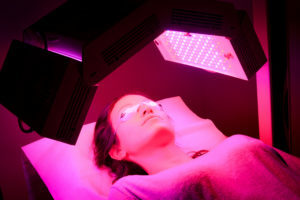 It involves controlled photothermolysis which destroys the epidermis and, where necessary, the superficial or deep dermis depending on the lesion to be treated. CO2 laser also makes it possible to reduce acne scars or post-traumatic damage. This type of laser treatment is also used to smooth wrinkles (laser resurfacing). This is a highly effective technique in the treatment of cutaneous ageing but it is invasive with long and difficult sequels. It has now been replaced in this indication by fractionated CO2 laser. Dynamic phototherapy (DPT) is a non-invasive treatment method. This new therapeutic alternative is aimed at selective destruction by light of pathological cells which have accumulated a photosensitising substance. The specific active ingredient is incorporated into a cream (Metvixia). After application, the cream is selectively absorbed by diseased tissues, making the tissues sensitive to light. Under the effect of illumination with red light, the cream becomes active and destroys abnormal cells in a targeted manner; these are then eliminated by the body within a few days. Healthy skin surrounding the lesion is not affected. One or two treatment sessions are needed. Mild pain, redness, scabs and oedema may occur in the following hours or days. These symptoms disappear spontaneously within a few days. DPT gives excellent results if the indication is appropriate. The current indications are actinic keratosis of the face and scalp, superficial baso-cellular carcinoma and Bowen’s disease.